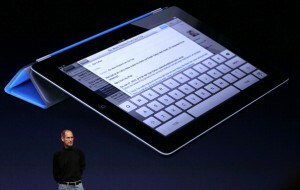 You'd have to be on the moon not to have heard about the release of the iPad 2 today. 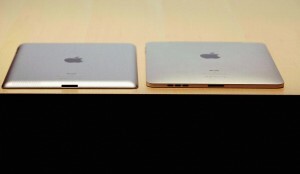 All of what had been predicted about the successor to the original iPad has been confirmed: It's lighter, thinner, faster, and has two cameras. And it's got a new SmartCover, which attaches magnetically to the screen and folds over every which way for optimal viewing. Other new features: available in black and white; dual-core A5 CPU for faster speed; can connect to your high-def TV with an HDMI-out cable; allows for sharing of iTunes; apps like iMovie and Garage Band allow for movie and audio editing; starts at $499 and goes up to $829. Release date: March 11. This thing is insanely fast. We're not joking -- it's blazingly fast. Everything the iPad 2 does feels like it's on turbo. We're uploading a video of the some evidence of this, you'll be appropriately stunned. It boggles the mind that it's thinner than an iPhone 4, yet doesn't seem to have that "ready to snap" cheapness other super-thin products have...I only touched (and oh, how I touched) the plastic one, but it was pretty easy wrapping it around the back of the iPad, and browsing with one hand. I preferred propping it up though, for typing on—it kind of shifts back slightly at first, which makes you think you've folded it incorrectly, but it resumes its natural place which seems to be the perfect height for typing on. Under the hood, the iPad 2 has plenty to brag about. 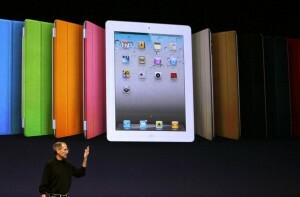 The new spec uses a dual-core A5 processor that promises to be twice as fast with nine times the graphics performance. I played a little Infinity Blade on the iPad 2 and aside from being awful at the game, I was impressed at the speed, detail, and fluidity of the graphics. Overall, it seems to be a hit with the press. As for me, I'll restrain my enthusiasm until I see it for myself -- and try not to feel too foolish for jumping on the original iPad soon after it hit the market. Who needs a camera on a tablet, anyway?